Aim: To mobilise youths all over the world for the promotion of the Olympic ideals of building a better and more peaceful world. Dates: Thursday 21st September International Day of Peace (United Nations) OR a day as near to this as best fits in with your school timetable. Difficulty: Easy – At the participating schools discretion. Preparation: A couple of hours to prepare and an hour for the event. 2. Choose a suitable venue/ exercise area. We swear. We will take part in the Olympic Games in a spirit of chivalry, for the honour of our country and for the glory of sport. 4. Participants may either walk or jog depending on their fitness levels. 5. There is a choice of three events to choose from which are in keeping with past and present Olympic Races: 200 metres, 800 metres and 1500 metres. Please take the age of participants into account. a. The Stadion Race founded in 776 BC Younger kids (kindergarten and 1st grade) to walk or jog 200 metres. The earliest measurement of the Stadion was 600 ancient feet or 192 metres). b. The Diaulos Race founded in 724 BC Second grade and up, to walk or jog 800 metres. (The earliest measurement of the Diaulos was anywhere from 1400 to 4800 Greek feet). c. The Dolichos Race founded in 720 BC This is a longer foot race and may be more appropriate for children over 12 or those with higher levels of fitness. The participants walk or jog 1500 metres. (The earliest measurement of this race would vary from 4409 feet to 15118.11 feet). The pupils of Nehemia School, Pogradec, Albania, joyfully joined the peace-loving army of school children all over the world, demonstrating their love for peace through competing fairly in running. Shkolla Nehemia, is a non- public school part of NEHEMIAH GATEWAY ALBANIA non-profit organisation. The crowning of those victorious with wild olive leaves in the form of a wreath. Luiza Besholli, Head of Youth Education. Thank you to Luiza and everyone from Shkolla Nehemia for bringing this together for Albania. Wonderful pictures from the Xewkija Primary School in Malta who took part in Stride for Truce 2016. The opening ceremony in Malta consisted of the Olympic song being sung, the doves of peace, a parade which included the carrying of the Olympic flame and rings. Pupils then took part in both the Stadion and Diaulos races.Well done to all the pupils, staff and Head Frankline Zammit Galea for coordinating a wonderful and fun event. Thanks so much to Sally Cameron, all staff and students in MaryMount School, Italy for this wonderful peace sign created to celebrate Peace Day 2013. 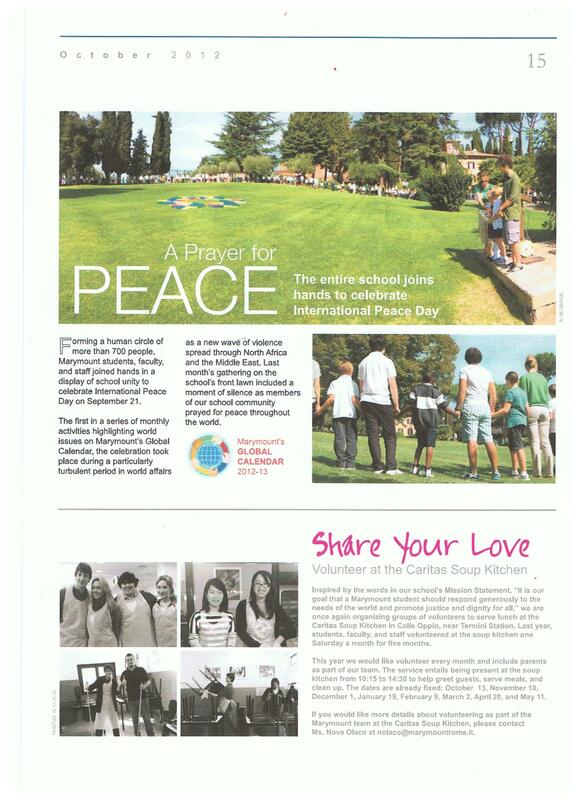 We thank Foundacioni Nehemia Albania for beginning a Circle of Peace Around the World for Peace Day September 21st 2012. Well done to all involved. All Staff and Students joined hands at noon their time and said a Prayer for Peace. 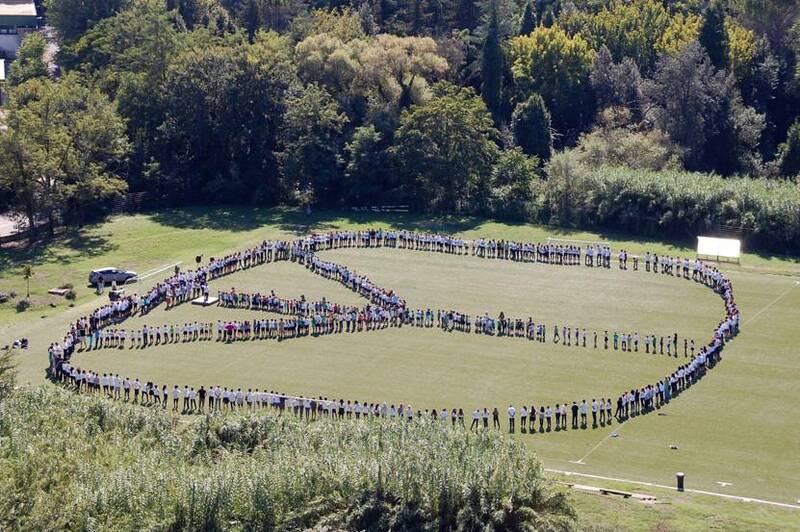 The Marymount School in Italy formed a human circle of more than 700 people which included students, faculty and staff who all joined hands in a display of school unity to celebrate International Peace Day on September 21st. This activity included a moment of silence where everyone said a prayer for World Peace. 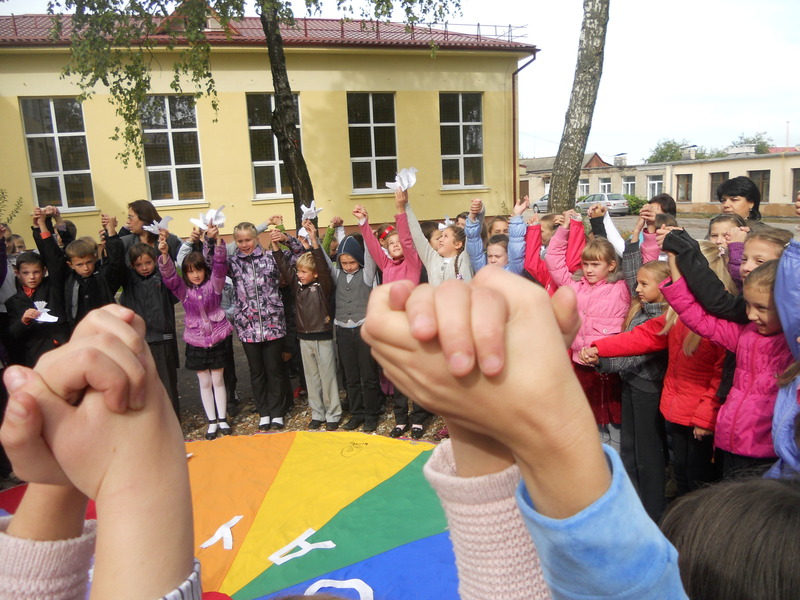 “At noon the students of 4, 5 , 6 and 7 grades together with teachers ( total 210 people) went in our school yard and joined their hands to be part of the International Circle of Peace. They sent their best wishes to the world and prayed for peace all over the world.It was the first time we had participated in such activities but it was unforgettable.” Irina Volynets. Special thanks to Irina Volynets, teacher of English and the coordinator of telecollaborative projects in Slonim gymnasium 1, Belarus. 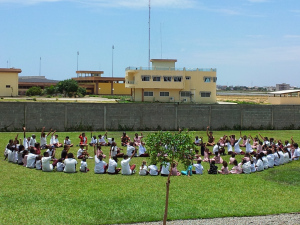 Thank you so much to Rebecca for sending us the photo for Benin’s circle of peace. A big thank you to all of those who have contributed to the Schools’ International Peace Quilt so far. It looks wonderful – the students’ contributions have really made this a truly inspiring and unique project. I’m delighted to let you know that we now have 203 countries represented on the Quilt. Please do spread the word about this project; we’ve had such a fantastic and moving response so far. We would love to have every country of the world represented so children everywhere have the chance to give their voice for Peace to the World. Please support all children. A circle is a powerful symbol that represents unity and harmony. It has no end. The day began with one mans’ vision, Jeremy Gilley, in much the same way that the Schools’ International Peace Quilt came about, but it takes everyone to come together with one vision to make it truly successful. Can you join us in a call for Peace ? We want to play our part and are calling for everyone involved in the Schools International Peace Quilt Project to take part in an activity for September 21st each year. As part of our commitment we would love the help of all your students and Staff to create something special, a CIRCLE OF PEACE around the World. This will work in much the same way as extending an olive branch. We would love for all students and staff to join hands on September 21st at 12:00 noon your time. For everyone to close their eyes for 1 minute and make a wish or a prayer for peace. In this way we create a continuous circle of Peace around the World. To mark this moment, you could stand everyone in a line, holding hands, with the two people on the ends of the line holding out their hands. Take a picture of each end of your line, i.e. two photos. Lucy is willing to join all Schools/ Countries Photographs together to symbolise us all joining hands in the name of peace. We look forward to hearing your stories which maybe sent to internationalpeacequilt@gmail.com and seeing your pictures of the event which we will add to your Schools/Countries Page on the blog.